I don’t remember the last time I saw so many people in an alley. Plenty of hungry office workers come to this rolling street kitchen during their lunch breaks — the line was 50 people long when I arrived. Erik Thompson said he comes here every Tuesday for a taste of the well-priced, unique Hawaiian-Korean menu. He ordered a spicy pork taco. Patty Hinkle likes that they have a vegetarian option. She chose tofu. Marination is one of a growing number of food trucks serving “curb cuisine” around Seattle. 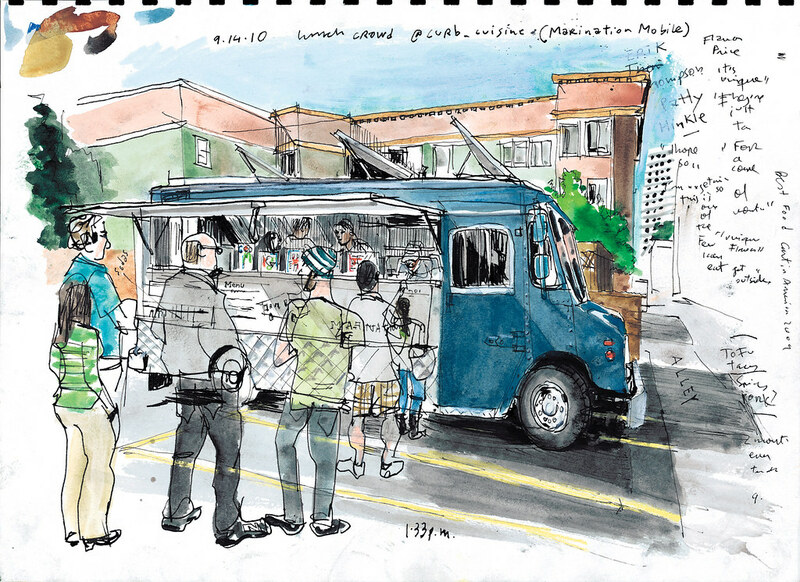 Taco trucks have been around for years, but they are usually stationary, said Marination’s owner Kamala Saxton. These relatively new trucks move from location to location letting their tech-savvy followers know where they are through their website and Twitter accounts — you can follow Marination @curb_cuisine. Because of city regulations, food trucks can only operate in private property, explained Saxton. The regulations make it difficult for food trucks, but “the city has so many challenges to face, I don’t expect this to be on top of the mayor’s list,” she added. I’d argue that the lively scene I saw at this alley Tuesday is exactly what downtown Seattle needs. Why not let the food trucks roam free? This one alone has already put Seattle on the map. ABC News Good Morning America selected it as the “Best Street Food Business in America” in 2009 and it stands among the top 10 most voted trucks in the Food Network’s “The Great Food Truck Race” online contest. The winner will be announced Sunday.